Creating art is a deeply personal experience for me. I am a student of curiosity. This leads me to seek inspiration in thebeautiful patterns, colors and designs of the surrounding world. I am driven to look closely at this beauty and interpret it in a fresh way. My senses are open to the hidden color in everyday landscapes; the deep purple of a cast shadow, the soft pink in a winter sky, and the bright red of a maple in autumn. Over the years I have experimented with many different mediums; pencils, ink, collage and pastel and oil. 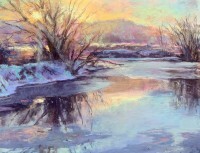 Pastels allow me to create shimmering, heightened color effects as well as to draw  and they support the freedom of spontaneity in my work. Working with brushes and oil is a more recent development in my artwork. Both mediums; pastel and oil influence how I work in the other and I enjoy going back and forth between them. 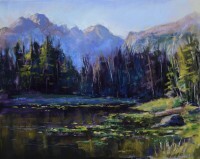 I balance my pieces between studio and plein air. Working in nature forces me to capture the essence quickly, while a studio environment allows a deeper exploration of the subject allowing me to reinterpret what I see in nature.